Rice pudding is something I love, but seldom think to make. This recipe is definitely going to change that! 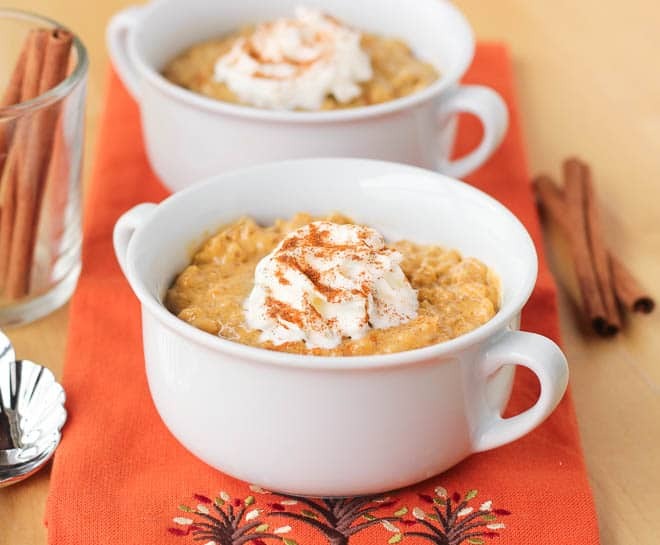 This pumpkin rice pudding is rich, creamy, and sweetly spiced. It is so creamy from the coconut milk, yet doesn’t taste at all like coconut. You would never guess it is dairy-free. I have recently fallen in love with sweet brown rice. It is slightly sweet and delightfully sticky, perfect for desserts! 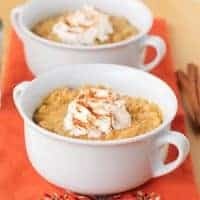 Rice pudding is an excellent, gluten-free choice for fall entertaining because it can be served warm or cold and made in advance. I love recipes like that! You can also make a very large batch of it to feed a crowd. 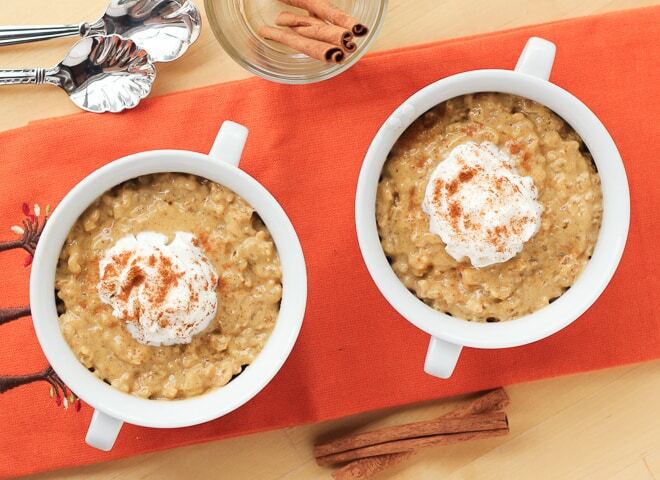 There is something so comforting about a bowl of warm rice pudding. I equally love it chilled, right out of the refrigerator topped with coconut milk whipped cream. My toddler and I enjoyed a leftover bowl of this for breakfast the day after we made it. We just couldn’t resist! With whole grain brown rice, pumpkin, and no refined-sugar I suppose there are worse things you could have for breakfast. This is also a very portable dish, making perfect to bring to a Halloween get-together for friends with food allergies. I’m sure we will be making this many times this fall! 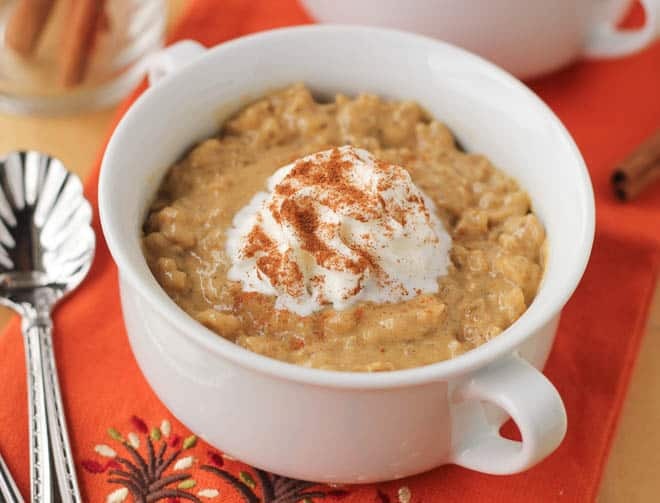 Combine the rice, coconut milk, almond milk, sugar, maple syrup, cinnamon, nutmeg, cloves, and salt in a large heavy-bottomed saucepan. Heat on high until the mixture comes to a boil. Reduce heat to low and cover. Cook for 45 minutes without disturbing. After 45 minutes, stir the mixture and continue cooking on low. Cook, stirring every 5 minutes or so until the pudding becomes thick and very creamy, about 25 more minutes. Towards the end you may have to stir more frequently and scrape the bottom to prevent it from burning. When the pudding reaches the consistency you like remove it from the heat and test the rice for doneness, just to be sure. Stir in the vanilla and pumpkin. Serve warm or chilled. Enjoy! OMG this looks so tasty Erin! I’ve never heard of sweet brown rice before, but I feel like this would also be great with a little quinoa mixed in too 🙂 Mmm!! I think sweet rice would be delicious with quinoa too! Maybe a yummy breakfast bowl with coconut oil and honey! 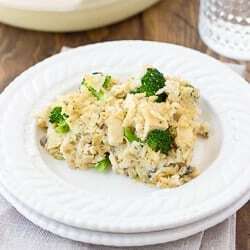 Hey … Wonderful recipe and it suits our rice perfect. Especially with the Ambemohar (its a traditional Maharashtrian rice). Thanks for posting this recipe. Unfortunately I don’t think so! 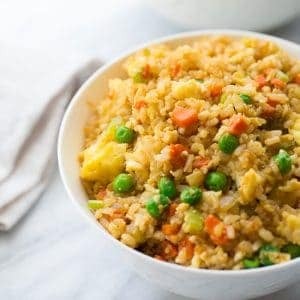 The sweet brown rice is very unique and gives the pudding it’s creamy texture. You could always try it though! Is the coconut milk the unsweetened variety, So Delicious or the like, rather than the canned sweetened coconut milk which I know is not very good for you? Looks great! Thanks! I actually do use canned coconut milk! I order it from Amazon and the brand is Natural Value. It is packed in a BPA-free can and the only ingredients are coconut extract and water. Can I use rice milk for this? My daughter is allergic to all nuts. She can do coconut milk. Yes, rice milk will work great in place of the almond milk. Thank you for this recipe. Want to try it soon now that the weather is cooling down…even here in Texas! Wondering if there is an alternative to the almond milk….I am allergic to dairy, nuts and my gut is very sensitive to the various thickeners (carrageenan, xanthan gum, etc). Like you, I use only canned coconut milk. Thanks for all the wonderful recipes you share with us! Hi Linda! I bet you can use another 2 cups of coconut milk + 2 cups of water in place of the 4 cups of almond milk. I haven’t tried it myself so I can’t say for sure. I think since coconut milk is thicker than almond milk part water will make the consistency the same! I hope this works for you. It’s delicious! Hi! That looks lovely, and I’m excited to explore your other recipes. I’m thinking of trying this in a slow cooker, do you have any thoughts on low vs high setting? Hi Julie! I haven’t tried making this in the slow-cooker yet, but I think that’s a great idea! I would cook it on low. I think it would probably take 4-6 hours. Let me know if you try that and it works! Can you recommend a way to make this sugar free? Could you make it with Stevia and sugar free Maple Syrup? Hi Donna! I wish I could be more helpful, but I haven’t experimented much with stevia. Let me know if you give it a try!